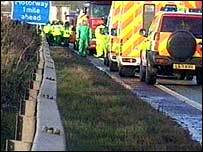 Police in Cumbria admit "lessons must be learnt" about how the aftermath of a fatal border road crash was handled. Hundreds of drivers were forced to sleep in their vehicles after the three lorry pile-up on the A74 between Carlisle and Gretna on Wednesday. Timothy Parker, 42, and his son Bryan, 12, from Eccles in Salford, Greater Manchester were killed. The route linking England and Scotland was reopened on Thursday night after a clean-up operation. Two police officers needed hospital treatment after coming into contact with a mystery red powder, which leaked from one of the crashed lorries. Cumbria's Chief Constable Michael Baxter said the substance had been "the main problem". Mr Baxter said: "We couldn't reopen the highway with this there. "Another problem is that we simply do not know what a lot of these lorries are carrying on our county's roads. "Barriers are something we need to look at. We will be having a thorough debrief with all the agencies involved, to see if our contingency plans worked well." He said he would be looking at ways to remove central reservation barriers to enable traffic to leave accident scenes more quickly. Mr Baxter also agreed with some motorists who claimed there were too few road signs informing drivers how to find alternative routes. Penrith and the Border Tory MP David MacLean, whose constituency includes the stretch of the A74 where the accident happened, criticised the government over its roads policy. He called on ministers to improve Cumbria's road network, especially the A74 and A66. Mr MacLean said: "I'm fed up nagging about the Cumberland gap, the A66 and other roads in my constituency. "I know the government consider railways to be a higher priority, but Cumbria cannot survive without decent roads." People were left stranded in their cars as police officers walked up and down the miles of vehicles with soup and cups of tea. Additional officers were drafted in from Northumbria Police to help divert motorists. Cumbria Police earlier said the recovery operation was restricted because the A74 only has two lanes and no hard shoulder, so gaining access was difficult. Police say it not thought to be dangerous to motorists as long as they remain in vehicles. Were you trapped in your vehicle following the crash? Have your travel plans been affected? Send us your comments. It is times like this I remind myself why I left Britain with it's traffic nightmares! £400m-plus spent on the Scottish parliament and yet we still have a bumpy, poor standard highway linking two of the major countries in the UK. For crying out loud, how difficult is it to build a stretch of motorway in an area as flat as a pancake? The police said it was "not thought to be dangerous to motorists as long as they remain in vehicles". Has the person who said this ever been stuck in a car in freezing temperatures for six or seven hours with a small baby or elderly person? What a complete idiot. The handling of this incident is a disgrace. I've heard people asking if an accident would be allowed to leave the M1 or the M25 blocked for more than 24 hours. Yes it would. I got stuck in a big motorway jam in 2003 on the M25, got diverted off to South Mimms services. Both sides of the M25 where closed, one side got reopened, the other remained closed for more than 24hours. Can someone please give us a transport secretary that isn't anti-car, actually has a drivers licence, drives daily and knows what the hell they are actually talking about? The current situation at 8.35am 23/12/04, and the ongoing traffic management shambles of the last 24 hours do not support the official police statements as reported here. Obviously, the definition of "trouble free" is very different in the mind of Cumbria Constabulary's spokesperson to that of the people continuing to be caught up in this mess. Would an accident have allowed the M1 or the M25 to remain blocked for more than 24 hours, with no obvious sign of a full clearance ? My wife was taking our children down to Manchester to visit their grandparents and take presents. She left home at 8:30 and only reached Gretna at 14:30 when she decided to give up and turn for home. During this time there was no information given about possible diversions. Although we both feel that the Police would have had a difficult job to do in these circumstances we also feel that there was a total lack of information given out to those who were trapped on the road. I live in Carlisle and work near Glasgow. I didn't even bother trying to go home yesterday, because of this fiasco. If this isn't a good reason to get on with the upgrade of the sub-standard Cumberland Gap to motorway standards I don't know what is. Yet again, this project has been put back to at least 2006/7 in the Highways Agency Roads Programme. Get on with it Tony. NOW. Stop putting it off. I was amazed to hear the Chief Constable saying that it was only minor roads that they had not got round to signing yesterday morning following the accident on A74. There was nothing to warn me against joining the M6 northbound at junction 43 at 8.00 am yesterday. I would have thought that the slip road would have been coned off, saving me a 5 hour wait on the 3 mile stretch of motorway. I know they were busy, but I would have thought it would have been in there interest to restrict the flow of traffic onto the motorway, and they did have 4 hours to think about it. Like the northbound traveller, there was no indication when travelling from Annan that there was any problem on the road at all. I spent four hours on the Gretna slip road trying to retrace my steps. Better signposting would certainly have helped, and more timely and detailed information given to the local radio stations might have prevented people from adding their vehicles to the chaos. I cross from Scotland each day to work in Carlisle, this is the second time in a matter of months that the Cumberland gap has been closed in both directions. It requires upgrading ASAP, but in the meantime the local emergency services need a plan to stop more traffic joining the roads leading to the Cumberland gap three or four junctions prior to Junction 44. Given more information people working or shopping in Carlisle could have parked up, used the train to get home and recovered their car next day. Without trying to sound churlish, maybe we should spare a thought for the father and his young son who were killed in the crash. I use this piece of road regularly travelling to my partner's parent in Fife. It is a sub-standard piece of road infrastructure and the funnelling affect of high-speed traffic in both directions over the metal bridge section of road is an accident waiting to happen. My condolences go out to the parties involved. Do stop whingeing on. Road travel is like that. As the long-suffering police point out there are only two lanes and no hard shoulder. There is also the option of the train or plane and despite the inaccurate garbage from the media criticising the railways, they offer a realistic, more relaxing, not to mention substantially safer alternative.